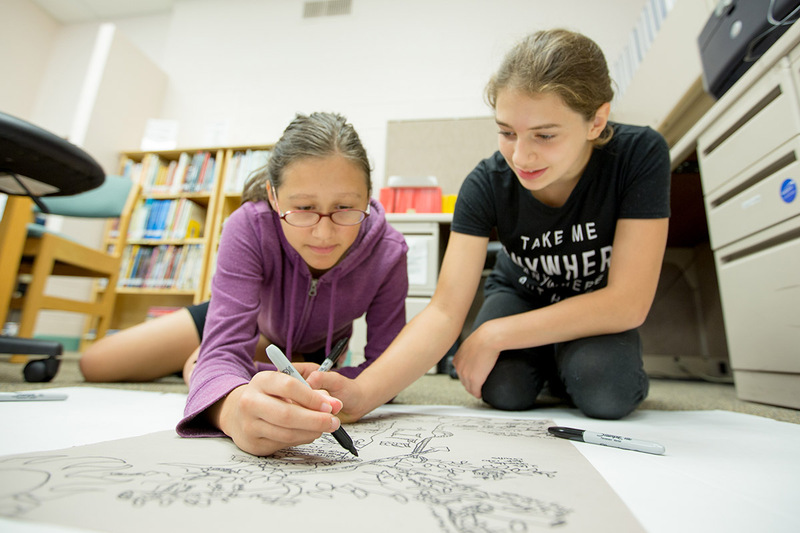 The Montessori Middle School offers students an environment that helps them maintain their sense of self while they face personal and external changes that accompany normal adolescent development. The curriculum is designed to help children develop critical thinking skills applicable to the real world and to evaluate and examine a broad spectrum of ideas, concepts and theories. Rigorous academics, merged with the practices of internal motivation, time management, problem solving and higher order reasoning allow students to develop a strong foundation for self-understanding and self-esteem. Writing, hands-on science experiences, careful instruction in mathematics, Spanish, music, arts and physical education ensure a rich and comprehensive experience for each student. Students enjoy abundant opportunities to interact with their surrounding world. They participate in varied off campus field trips, cultural experiences and meaningful community service activities. Middle School is for children from 12 to 14 years of age and is the equivalent of 7th and 8th grade. Class is held from 8:45 AM to 3:15 PM. Our Elementary Encore Program is available from 3:15 PM to 6:00 PM. The middle school program prepares students for both high school and university studies.